The speech last night was depressing for its predictability, its lack of self-awareness, and its lack of solutions to help America get back on track. It was, however, stunning to listen to the president still trying to sell his misguided health-care law to the public as if nothing had happened. That takes some courage. Over at Forbes, Cato Institute’s Michael Cannon has a great piece that looks at the president’s statements about Obamacare. [The President]: And here’s another number: zero. Because of this law, no American can ever again be dropped or denied coverage for a preexisting condition like asthma, back pain, or cancer. No woman can ever be charged more just because she’s a woman. And we did all this while adding years to Medicare’s finances, keeping Medicare premiums flat, and lowering prescription costs for millions of seniors. [MC]: Oh, really? The Washington Post reports ObamaCare plans are discriminating against the sick. The whole thing, which would be funny if it weren’t so sad, is here. Now, I noticed last night that the president got some of his biggest applause when he was talking about Obamacare. Does that mean the Democrats are planning to run on the law? I am sure that Republicans would love that. I guess I shouldn’t be too surprised by the president’s victory lap about his health-care law since he also seemed to take credit for the increase in oil production on private lands and for the successes of fracking. This also takes some courage considering he has been stalling for years on the Keystone Pipeline project. The speech was also peppered with the same old prescriptions for reviving the economy like more small-business loans and green-energy loans. It won’t work, but it will continue to make special interests grateful. The saddest part of last night, however, is that America does face real problems that were completely ignored by the president. First, there’s bad news coming our way because of other pending Obamacare requirements, in particular for small businesses. No mention of that. Also, he didn’t mention anything about finding a solution to reforming the drivers of our future debt: so-called entitlement spending. 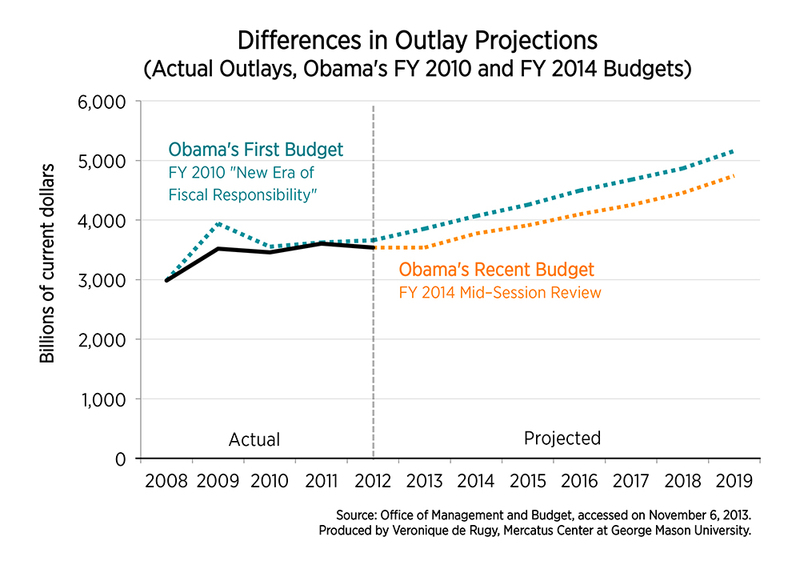 Instead, he talked about having cut the deficit in half since 2009, which isn’t hard when you start with an extremely large deficit and Congress doesn’t let you spend as much money as you had hoped when you got into office (chart here). He focused on the short-term, but he must know that the spending on these programs is set to explode in about ten years, consuming an ever-growing share of the budget.The cost to the country will be steep.Younger Americans and future generations will have to pay for this expansion in the form of higher taxes, slower growth, and higher unemployment, while older Americans may face unexpected reductions in their benefits without having been able to plan for it. And there was no mention of disability. The president must know that the program is projected to be insolvent in just two years. That makes it his problem. How about the incredible delays at the VA? He had a remarkable story to tell about a veteran putting his life and health on the line for this country. Is he planning on making sure they get the help they deserve when they come back home injured? Overall, this was a very depressing spectacle. More of the same policies that do not work, a lot of taking credits for things that the government has nothing to do with, a complete belief that the government and the president have powers to fix the economy and interfere in our lives, and no real concerns or ideas to put this country back on track.